A talented young performer’s dream has come true after securing a place at a top performing arts school. 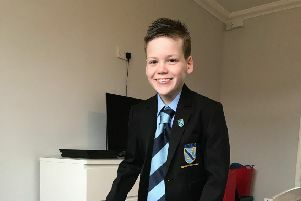 Hartlepool teenager Jack Penfold, 17, has been training at Val Armstrong School of Performing Arts, in Hartlepool, since the age of four. And now the incredible dancer and performing arts student looks one step closer to achieving his goal of performing on London’s West End. Jack, who is currently studying at Stockton Riverside College, looks set to leave one year early to take up his scholarship place at Laine Theatre Arts in September. He secured a three-year paid scholarship for the school based in Epsom after blowing away staff at his entrance audition earlier this year. Mum Sarah Penfold couldn’t be prouder of her son, who excels in jazz and contemporary dance, saying his dreams have come true. He said: “It is a big deal getting a place. “We found out that he had a place quite a few months ago ut her has to go back for a funding audition last month and just found out that he has got the funding to go, so we are all absolutely ecstatic. “So now we just have to wait and see what happens next. “The place would have been a lot of money so he wouldn’t; have ben able to go if he hadn’t got the scholarship. At the school Jack will be doing a diploma in Professional Musical Theatre. Sarah, who is also mum to Max Penfold, who is also a talented dancer at Val’s school, added: “Laine was the only place that he had applied to. “But he has done it. It is outstanding. “It is a year earlier than he thought he would go, but the faculty at Stockton Riverside College have been so supportive have really pushed him, as have Val and Holly at Val Armstrong School of Performing Arts. “They rang me to let me know so I had to break the news to him and he was in shock. “It was very emotional, it is a dream come true. Ahead of his big move down south, Jack will join his fellow performers at Val Armstrong School of performing arts as part of the team UK squad competing in the Dance World Cup in Barcelona this June.